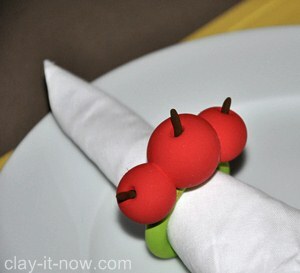 Cherry napkin ring is my favorite project to share with parents and Sunday school teachers. It's easy, useful and beautiful. You made the clay napkin ring with your kids (girl or boy) now. One day when they have grown up, take out the craft and display it again on your dining table. Can you imagine how would they react? Beautiful surprise, isn't it? Did you see the value of this simple project? I am using Crayola Model Magic. It's soft and easy to handle for kids as young as 3 old years. Buy standard colors yellow, blue, red, black and white. Alternatively, you can use homemade clay such as cold porcelain, soapy clay or salt dough if you want this to dry hard. You may check out our modeling clay recipe to make your own clay. First of all, prepare green, red and brown clay. 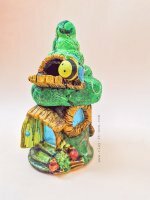 You can mix yellow and blue color clay with varieties of amount to get the green color you like. You can use black for the tiny stem or brown color. Mix red, yellow and black to get the brown color. Roll the green clay to a pipe or sausage claybasic shape with diameter about 0.5 to 1.0 centimeter. Join the the two ends with white glue to make the ring and let it dry. Roll 3 ball shapes of red color clay for the cherry. I have one big and two small ball shapes clay. Take your clay tool or pencil tip and press it to the middle of the cherry. Make small stem from brown clay and insert it to the above. Arrange the cherries in the middle of the ring and attach to it with glue. That's it! We've done now. This is the picture of the ring placed on the dining plate. For variations, you can have a big single cherry with the ring or couple of smaller cherries to form the ring itself. This cherry can also be used for kids accessories like hairpin, hair band, pendant, earrings, bracelets. Did you make this craft? Would you like to share your picture? Please use the submission form at this page to submit your craft or upload your picture to our Facebook page.